Humans have canine teeth for eating meat. 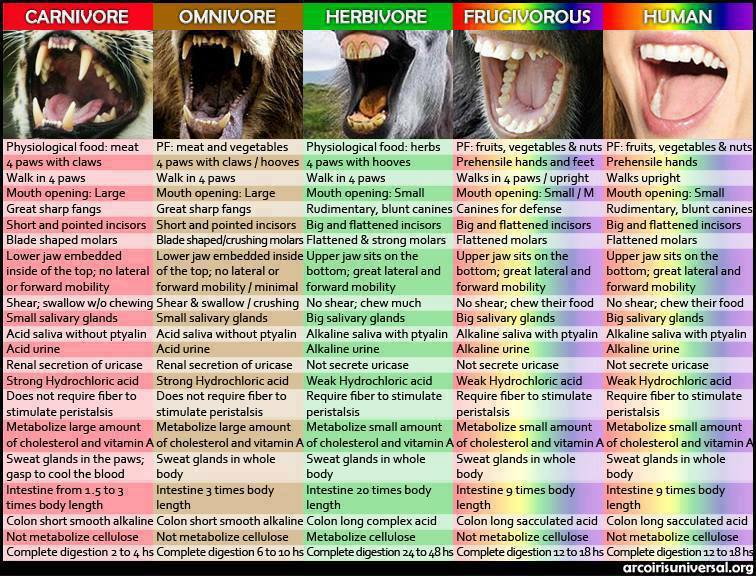 For starters, canine teeth do not indicate whether you are carnivore, herbivore or omnivore. Nearly all mammals have canine teeth including horses, kangaroos and deer which are all herbivores. In fact, the largest canine teeth of any land mammal belong to the hippopotamus which is herbivorous. Some more examples of herbivorous animals with massive canine teeth are gorillas, saber-toothed deer, Gelada baboons, camels, javelinas. Canine teeth are in no way unique to carnivores. Humans have canine teeth but they are dramatically different from the teeth exhibited by carnivores. Human canines are blunt and wide while carnivorous canine teeth are very long and scissor-like. The dental structure of humans share a lot of similarities with herbivorous cows and horses. In fact, so much so that bovine teeth have actually been used successfully as substitutes for human teeth.